I am happy to say that I feel like I am doing really well with this goal! Of course it helps that LM is constantly asking to listen to music, my part has mainly been providing her with fun and appropriate options. 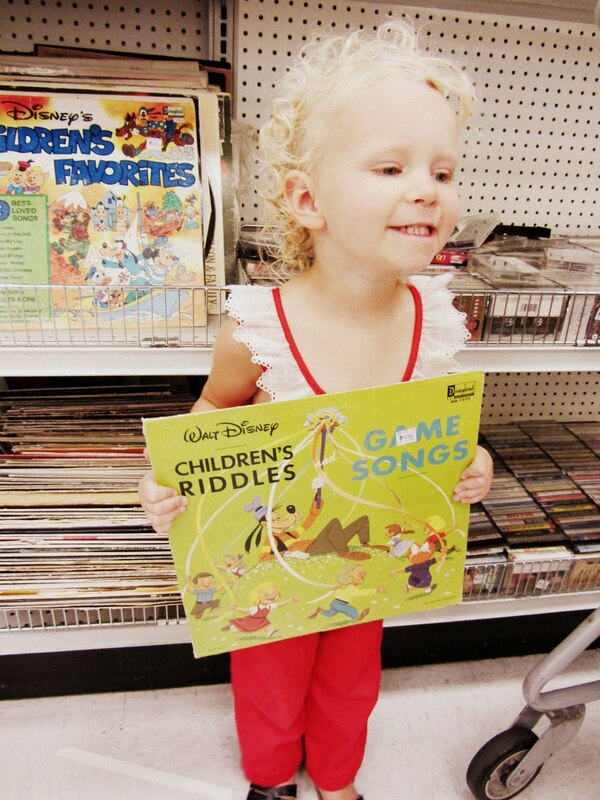 Her favorites are the Yo Gabba Gabba cds, the Cars soundtrack, Popcorn Bopping, and her Sesame Street 'Feelings' record. She loves to sing along and I am amazed at her ability to pick up on the lyrics quickly. It makes me smile when she chooses to spend the afternoon spinning records, or requests a specific song on repeat in the car while she bops her head and sings along. 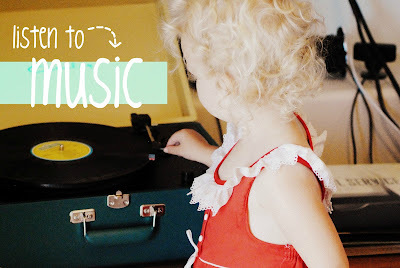 I hope her love of good music will continue to grow and grow... this is definitely a resolution we will keep up every year! Awesome you have a record player. I wish I did! Beck loves Veggie Tales sing along cd's in the car. If I need "calm" in the car, but not quiet, I love to pop in Paul Cardall's children hymns. It's the primary songs kid's know and love, but piano music. It's very calming and beautiful music. I also don't mind letting him listen to "adult" music so long as it's clean... there are a couple Regina Spektor songs that are super bubbly that Beck dances to and he likes Pop Goes the World by Men Without Hats. Also, try Frances England.. she sings pretty cute kiddo songs. We are big music lovers in this house too, including Beckham (might get that music loving from his Dad as well). Anyway, hope that helps. I love that idea--a record each thrifting trip! 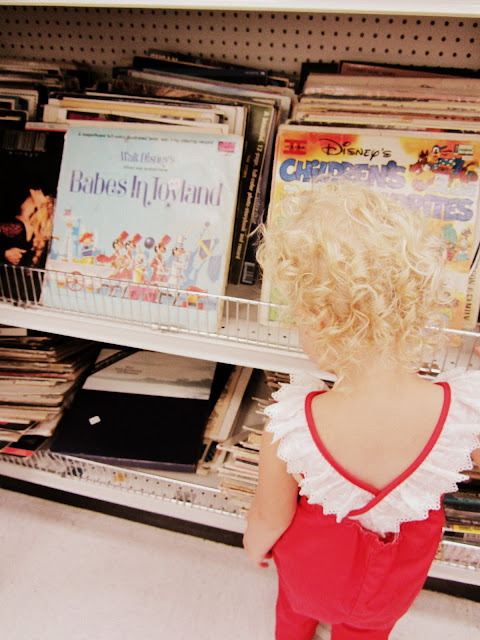 I can't wait to start building a collection of children's records for Lucy. All I have now are a few Disney movie soundtracks. That's awesome Stacy! I always say I need to listen to more music and need to make sure I stop and pop some on too. It's great for our little people at this age too, Ivy loves having a good old dance! That's so cute! :] And what a good goal. I love it! I want to let my kids pick out fun records someday! Hmm that's a great idea! I probably have some records from my own childhood still packed away! My uncle would buy them for me, despite the fact that tapes were the rage. Records sound "warmer" he would tell me. A local thrift store here has tons of records, I never thought to look for ones for kiddies! Oh my two year old is obsessed with Laurie Berkner as are a bunch of his buddies! This is such an awesome idea. I need to get a record player first though!